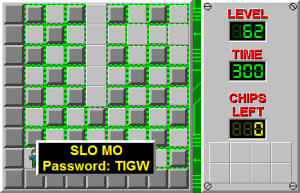 Slo Mo - The Chip's Challenge Wiki - The Chip's Challenge Database that anyone can edit! Slo Mo is the 62nd level in Chip's Challenge 1. 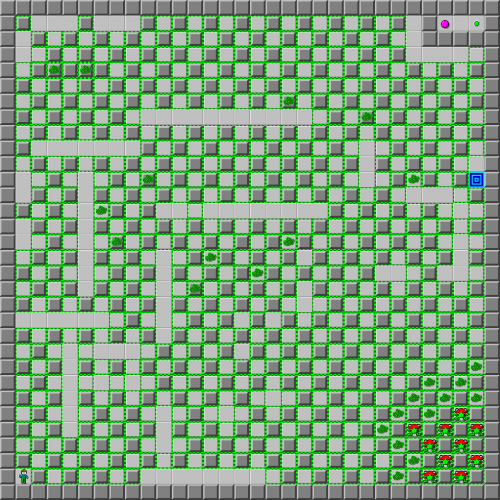 The level is a mess of toggle walls that switch only once every four moves, with teeth and blobs chasing Chip; fortunately, there are some open corridors for Chip to move through. The teeth won't get in Chip's way, but there are bunches of blobs that are typically located near the corridors, and once they come in, it's tough for them to come out. This means that Chip won't succeed a majority of the time, but it lasts only eighteen seconds, and no faster route is known. For many years, this level along with Jumping Swarm were believed to be the only two levels in Chip's Challenge 1 that are impossible to get a time of 1 second remaining on. Jumping Swarm has not been proven possible or impossible due to the absurd number of potential random seeds; however, in December of 2018, Kacper Leszczyński, by slowing down the game speed drastically, proved that it was in fact theoretically possible to finish Slo Mo with just 1 second remaining.